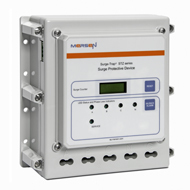 Surge-Trap Pluggable Surge Protective Device (SPD) is a no-fuse, fail-safe surge suppressor featuring Mersen’s patented TPMOV® technology inside. The pluggable SPD is UL 1449 Third Edition approved. It is DIN-rail mountable featuring a fail-safe self-protected design, visual indicator and a small footprint. A remote indicator option provides status to critical control circuits. The Surge-Trap Pluggable SPD has a high short circuit rating and a thermally protected MOV, which eliminates the need for additional overcurrent protection devices.